Sidney Suppey's Quarterly & Confused Pet Monthly - ZineWiki - the history and culture of zines, independent media and the small press. 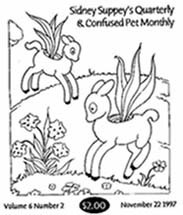 Sidney Suppey's Quarterly & Confused Pet Monthly is a zine by Candi Strecker. Published in Brisbane, California, U.S.A., Candy Strecker first released this title in 1979 and continued publishing throughout the 1980s and 1990s. Approximately 24 issues were published. Strecker describes it as; "a mix of mutant trash culture, thought-provoking juxtapositions, bemused natterings and street-level anthropology." Candi Strecker also does the zine It's A Wonderful Lifestyle. She has written for the San Francisco Bay Guardian, was interviewed for the Re/Search Publications book on Exotica Music entitled Incredibly Strange Music Vol. 2, and writes for zines such as Bruce Townley's Oblong. This page was last modified on 14 December 2011, at 11:44.